This is a 3-hour introductory course taught through Metro Community College. Iridology is reading the messages revealed in the eye. The eyes have long been known as “The window to the soul”, they are also a window to your body’s health. Your iris-print is a distinctly unique reflection of who and what you are. Thousands of nerve fibers connected to your cells, tissues, and organs transmit their information, up the spinal cord to the brain, then map this information on the iris of eye. By examining the iris fibers, iridology can reveal levels of health, inflammation, toxicity, genetic strengths and weaknesses. 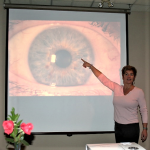 Iridology is a holistic system that reflects your physical, emotional and mental well-being. In this course you will discover how to see; the different systems of the body in the eyes; and how to read basic iris signs; and see personality qualities and traits! You will have the opportunity to have your own iris photos taken. The class is action packed and full of insight.